Daily Illuminator: WashingCon 2 Was A Success! October 23, 2016: WashingCon 2 Was A Success! Here's a riddle: What's full of games, super fun, and happens in Washington, D.C.? Okay, we lied. It's not a riddle. It's just a regular question. And the answer is: WashingCon! The second iteration of this annual convention took place at the end of last month, and it was fun for all. 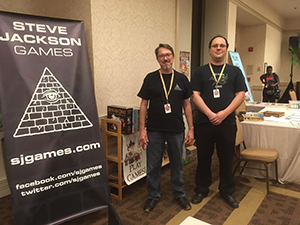 Steve Jackson Games didn't have a booth there, but we sponsored the event. Here's some pictures! The show saw 1,000 attendees over two days. There were games, demos, five panels, dozens of special events, and 12 tournaments – including a giant, 30-person game of Catan. Now that's impressive. The con is slated to happen again next year. So if you missed it, you've got another chance!